Farmers in Atari use animal draught power and a scraper to level the land for irrigation. The team moves in a roughly circular pattern around the field, cutting raised parts and filling depressions until the field is flat. The area around Atari is characterized by a long dry season and semi arid conditions, but with permanent rivers running through from the slopes of Mt. Elgon. Farmers often use small engine pumps to get water from these rivers to grow vegetables from August to April. Most farmers have been using open pipe flooding, simply allowing water to flow and moving the pipe whenever the area surrounding the outlet gets saturated. This area has very fertile clay loam soil with very good granular structure and infiltration. It is high in organic matter and nutrient status, and is of very mild slope. Atari is about 70 km from the nearest major urban center, but traders of various crops are common in the area, and there is common knowledge of outlets to sell vegetables. Most of the project members have been growing rice and upland cereals, but have not been using engine pumps due to the high cost of equipment. The project is working with the group to sustain the operation of a more cost effective upland irrigation system for vegetables. Atari is located in the semi-arid area north of Mt. Elgon, where the natural habitat is mainly open grassland with acacia and other semi-arid trees. Rains typically fall from April to August, with some scattered showers up to November. Due to high winds and lower humidity the area has a high evapotranspiration rate relative to most of Uganda. The area is largely used for grazing, with some areas converted into farmland. Large swaths are government-managed protected areas, with restricted access for local people. Soils range from sandy loam to clays, with large areas of vertic soils. Common crops include maize, beans, taro, and rice for both home consumption and sale, as well as cotton and sunflower as cash crops. Vegetables, especially tomato, are often grown in areas near rivers. Atari group members set up a taut string to refine the level of the field surface. Farmers use a flexible pipe to deliver water directly into the furrows. This method produces almost no loss of water, and does not require precise leveling of furrows. Most members reported being very satisfied with this system in part because of its ease of use — one farmer told our project team that she can even ask her teenage children to help with irrigation, which frees up her time for other household tasks. In this system, a length of pipe is buried extending to the center of the area to be irrigated. At the end of this buried pipe, a standing section is attached that brings the water to the surface and can rotate. To this rotating end the farmers attach further sections of flexible pipe to apply the water to specific plots within a radius around the central point. This system allows several farmers within the radius to use the system, and has a lower cost per irrigated area than many other piped irrigation options. Land leveling is required for many irrigation methods, but is very labor-intensive when carried out by hand. 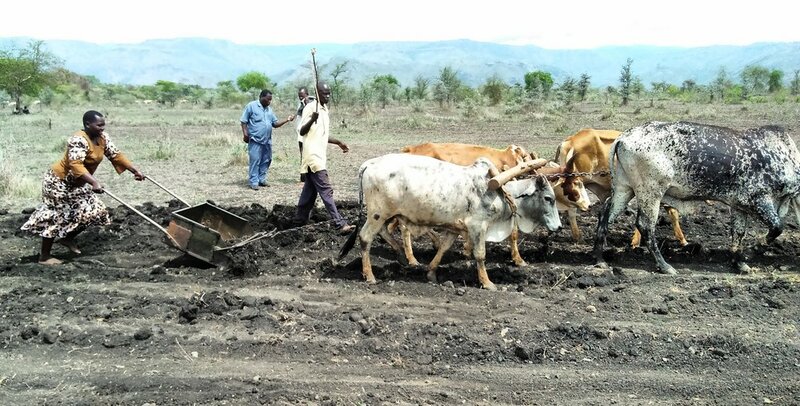 Horticulture irrigation group members organized the hire of oxen to level a large section of the irrigated area. This made further refinements by hand to smooth and level the land surface easier and faster. Farmer Asiimwe Mary (in red) watches water flow into furrows in a direct-fill system.